Pootles aka Sam owner of Pootles Papercraft, You Tube sensation and award winning blogger, who also happens to be the team leader of the Stampin' Up! team I am a part of, opens up her blog to those of the team who have a birthday each month and as it's August I can take part! Let's not mention that it's my 50th birthday which is fast approaching shall we. For this one I made a card... 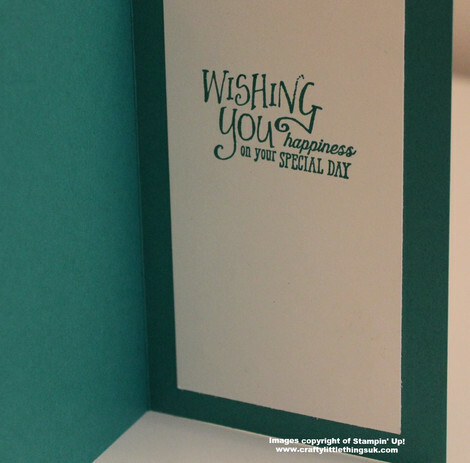 I'm rather getting into the swing of card making now and am definitely finding that my style is very simple yet sometimes manages to be stylish. I think. I'm more of a 3D project maker but never say never to new things. Be sure to check out all of the other gorgeous creations in the hop at the end of this post and spread some love by going and reading, liking, following and commenting. I wanted to pay homage to the 2016/18 In-Colours with this card. I feel I've neglected them a little as I've become obsessed with the new 2017/19 In-Colours. So I made a card base of Emerald Envy measuring 6 x 4 inches (15.2 x 10.2 cm) when folded. On top of this I added a mat of Very Vanilla which I downsized just a quarter inch (0.6cm) on each all around which I had stamped using Emerald Envy ink using a stamp from the Background Bits stamp set. I wasn't too careful with my stamping, I wanted to create a bit of an impressionist feel that was imperfect. I love imperfect and out of kilter and non symmetrical so randomly stamping in a hit or miss style is good for my soul. 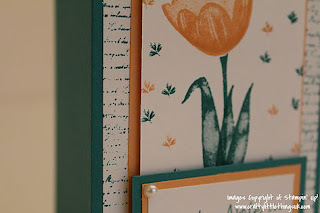 I downsized a half inch all around on a piece of Peekaboo Peach cardstock next and then on top of that I took Very Vanilla a quarter inch smaller again and stamped it using Tranquil Tulips stamps in Peekaboo Peach and Emerald Envy, carrying that 2016/18 theme through. Isn't the tiny leaf stamp just gorgeous? I hadn't even noticed it before. Expect to see more of that in the near future. I then took a sentiment from Better Together and stamped onto a 1 x 2.5 inch (2.5 x 6.4 cm) piece of Very Vanilla using Emerald Envy ink. I then sized up a couple of pieces of card stock and used trusty Tombow Multi Purpose Adhesive to stick them together then attached to the card front using Stampin' Dimensionals. A couple of pearl basic gems and an internal sentiment on Very Vanilla from the Better Together set again and it was done! 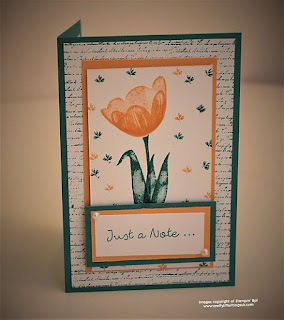 I've listed everything that I used to make this below (all current Stampin' Up!) which you can click on to be magically whisked off to my store to purchase and copy if you want to. 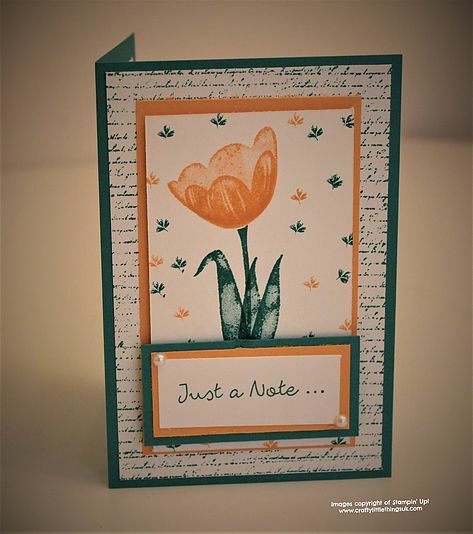 Just one thing about the Tranquil Tulips and Background Bits stamp sets which I used in this project, they are both host sets so that's means if you host a party you can grab them with your rewards. I love both of them and they are a great reason to open up your home for an hour, invite your local demo round and get some friends to try out some products and thumb through the catalogues. If they get as excited as I do about the Stampin' Up! goodies you may find you can choose your hostess set for free! Talk to your nearest demo about hosting a party. With the new Autumn/Winter catalogue about to launch it's a great time to build up your stash with friends. Thank you for dropping in and thanks to Pootles for sharing her platform with us.